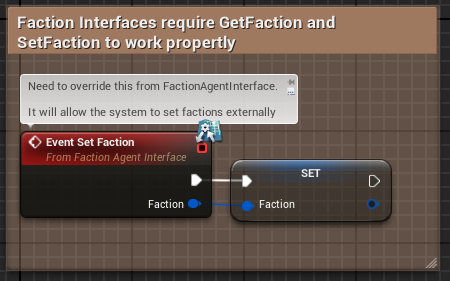 For an actor to have a faction, we need to add a FactionAgentInterface. This will allow the system to set and get the current interface. Factions require your actor to define how to get and set a faction. That can be done overriding GetFaction and SetFaction. Sometimes you may want a controller to share a faction with its controlled pawn or character. This process is exactly the same as before, except that instead of getting and setting a variable, we will get and set the faction from our pawn.